According to the 1962 Missal of St. John XXIII the Extraordinary Form of the Roman Rite, today is the feast of St. Josephat, a Catholic of the Ruthenian rite. He was an apostle of the return of the Orthodox schismatics to the Church of Rome. At the age of twenty he became a Basilian monk, and while still young was made superior of his monastery, then archimandrite of Vilna and finally Archbishop of Polotsk. The young Archbishop's zeal for the cause of the "uniates" aroused the hatred of the schismatics, and he was murdered by a mob at Vitebsk in 1623 at the age of forty-three. His prayer contained the conversion of his murderers. He is one of the patrons of Poland. His feast in the Ordinary Form of the Roman Rite is celebrated on November 12. Historically today is the feast of St. Lawrence O'Toole the Archbishop of Dublin during the takeover of Ireland by the Normans and King Henry II. His efforts in the peace process and his frustration with King Henry probably caused his early death. Highly honoured at Eu in Normandy, France, where he died. St. Lawrence O'Toole was born around 1128 in County Kildare, Ireland. His father was the chief of Hy Murray, and his mother one of the Clan O'Byrne. At the age of 10, Lawrence was given up as a hostage to King Mac Murehad of Leinster, who treated him with such inhumanity that his father obliged the King to turn him over to the Bishop of Glendalough. St. Lawrence grew to be such a model of virtue, that at the young age of 25 he was chosen to replace the Bishop as abbot upon the Bishop’s death. He governed his community with virtue and prudence, and was unanimously chosen to fill the new See of Dublin in 1161. In 1171, St. Lawrence visited King Henry II of England to handle affairs of his diocese. While approaching the altar to officiate at Mass, the Archbishop was violently attacked by a maniac. Everyone present thought he was mortally wounded, but Saint Lawrence came to, asked for some water, blessed it and applied it to his wound. The bleeding immediately stopped and the Archbishop continued to celebrate Mass. St. Lawrence was most widely known for his piety, charity, and prudence, and was respected as a negotiator. He died on November 14, 1180, at Eu in Normandy. He was canonized in 1225 by Honorius III. Visit A Year of Prayer: 365 Rosaires for another life of St. Lawrence O'Toole. Purgatory is not eternal. Its duration varies according to the sentence pronounced at each particular judgment. It may be prolonged for centuries in the case of the more guilty souls, or of those who, being excluded from the Catholic communion, are deprived of the suffrages of the Church, although by the divine mercy they have escaped hell. But the end of the world, which will be also the end of time, will close for ever the place of temporary expiation. God will know how to reconcile His justice and His goodness in the purification of the last members of the human race, and to supply by the intensity of the expiatory suffering what may be wanting in duration. 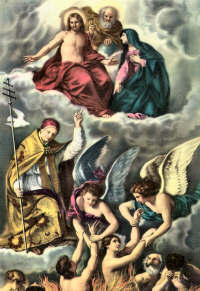 But, whereas a favorable sentence at the particular judgment admits of eternal beatitude being suspended and postponed, and leaves the bodies of the elect to the same fate as those of the reprobate; at the universal judgment, every sentence, whether for heaven or for hell, will be absolute, and will be executed immediately and completely. Let us, then, live in expectation of the solemn hour, when "the dead shall hear the voice of the Son of God." He that is to come will come, and will not delay, as the Doctor of the Gentiles reminds us; His arrival will be sudden, as that of a thief, we are told, not only by St. Paul, but also by the prince of the apostles and the beloved disciple; and these in turn are but echoing the words of our Lord Himself: "As lightning cometh out of the east and appears even unto the west: so shall also the coming of the Son of Man be." Say a prayer for the Poor Souls; for instance, recite the Little Litany of the Holy Souls. Offer up some small sacrifice for the relief of the most abandoned soul. "It is therefore a holy and wholesome thought to pray for the dead, that they may be loosed from sins" (Mc. 12:46).